Congratulations to Jake from Meden Vale who passed his test at the first attempt after taking lessons with Ian. Congratulations to John on passing your driving test – from Revolution Instructor Simon. Lauren passed her driving test recently after taking lessons with Simon. Well done! Congratulations Brandon on passing your test first time! Leo passed his test at the first attempt. Congratulations from your instructor Ian and all the Revolution team. Ryan from Forest Town took his driving test at Ashfield Driving test centre and passed with only one DF even got a handshake from his examiner. Well done Ryan from the Revolution Team. Congratulations to Amie from Wirksworth near Matlock who passed her test first time at Ashfield Driving Test Centre on the 2nd April. Well done to Sian from Wirksworth near Matlock who passed her test at Ashfield Test Centre. Sian took her driving lessons with Revolution Instructor John. Evan from Rainworth passed his Practical driving test with only 3 driver faults after taking driving lessons with Revolution Driving Instructor Michelle. Ross from Wensley near Matlock passed his practical driving test with just ONE driver fault at Buxton Test Centre. Congratulations Ross from your instructor John and all the team at Revolution. Ebony passed first time after overcoming her ‘jelly legs’. When she started taking her driving lessons she was very nervous and is now a great driver able to deal with everything the roads throw at her. Well done from you instructor Ian and the Revolution team! Ryan passed at the first attempt after taking lessons with Rob. Well done from the Revolution Team! Charlotte took lessons in Mansfield with Revolution Driving Instructor Ian as part of our Fast Pass course. Charlotte now not only looks forward the 7, (yes SEVEN!) minute drive to work every morning but also the freedom that her driving licence now gives her. Adam took driving lessons in Mansfield with Revolution Driving instructor Rob and passed at the first attempt. Now looks forward to the daily trip to KFC. Lucy took driving lessons in Sutton in Ashfield with Revolution Instructor Simon and passed first time with only 4 driver faults. Gagan from Mansfield passed first time with Revolution. He took a test with another driving school in the past but didn’t pass, so decided to try to pass his test with Revolution Instructor Rob. Congratulations to Vikay from Mansfield on passing her driving test today at Ashfield Driving Test Centre. With only a handful of driver faults, Vikay smashed her test she can now get a car to help with her career. Well done and all the best from everyone at Revolution. Congratulations to Maisie who passed her driving test last week after taking lessons with Revolution Driving instructor Ian. Maisie works in Nottingham so now she can drive to work meaning she can get some very important extra sleep in the mornings. Well done Maisie from everyone at Revolution Driving Lessons. Tammy passed on the 25th January 2019 after taking driving lessons with Michelle. Tammy now is looking forward to travelling to see her family who live near Skegness. A huge well done to Georgina from Mansfield who passed her driving test first time with only 3 driver faults. Georgina already has a car to get up and running in. Congratulations again from your instructor Rob and the whole Revolution team. Congratulations to Mark from Blidworth who today passed his driving test with only 1 driver fault. Mark passed first time after a long break from driving. Now openly says how much he enjoys driving! Well done Mark from Rob your instructor and the whole of the Revolution team. Congratulations to Jack from Ravenshead who passed his test with only a couple of driver faults. Well done Jack from the whole team at Revolution and your instructor Rob. Massive congratulations to Tyler who passed his Practical Driving test at Worksop at the first attempt. Having a full licence will allow Tyer to travel back down south to visit friends and give him his freedom. Well done from the whole team at Revolution and your instructor Rob. Congratulations to Casey from Mansfield who passed her test after an accomplished drive with only 5 driver faults. Well done from your Driving Instructor Rob and the whole Revolution Team. Well done to Beth who passed her driving test at the first attempt. Beth did it with only 6 driver faults, two of which were for driving like a granny. 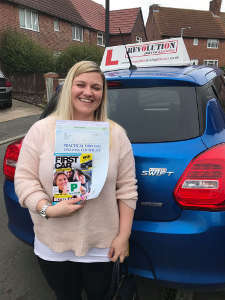 Beth took driving lessons with Revolution driving instructor Ian and can now allow her boyfriend to have a lie in and not take her to work at 4am. Congratulations from the whole Revolution team. Massive congratulations to Krissy from Mansfield. Krissy smashed her test with only 4 driver faults at the first attempt! Merry Christmas and well done from the whole Revolution team and your instructor Ian. Massive congratulations to Jake from Forest Town. Jake smashed his driving test at the first attempt with only a handful of driver faults. Jake now looks forward to taking the kids on day trips, with the zoo being high on the to-do list. Congratulations to Cameron from Mansfield Woodhouse who passed his driving test at Ashfield Driving Test Centre. This was Cameron’s first test with Revolution after a bad experience on a previous test. Cameron battled his nerves and smashed it. Congratulations to Adam from Edingley. Adam navigated the horrific weather and drove confidently and safely to ace the test. He can now get out and about on his days off in his ‘gold’ rover! Well done Adam from the whole team at Revolution especially your instructor Michelle. Congratulations to Jody-Lee on passing his driving test after taking lessons with Revolution instructor Rob. He can now drive to work rather than waiting for the bus. Congratulations to Lauren on passing her driving test on Friday 16th November 2018. Lauren passed with only a hand full of driver faults on the drive and did possibly the fastest reverse bay park in the history of driving tests. Well done and good luck (hope your car passes the MOT) from the whole team at Revolution and your instructor Ian. Congratulations to Sylwia from Alfreton who passed her driving test on 26th November 2018 at Ashfield Driving Test Centre. Sylwia took driving lessons with Revolution instructor Simon and can now look forward to a warm winter in the car rather than queuing for the bus. Well done from everyone at Revolution. 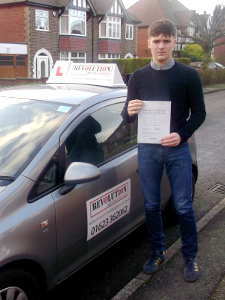 Congratulations to Jack from Kirkby in Ashfield who passed his driving test on 20th November at the first attempt. Jacks test is special too as he passed without the examiner being troubled to write anything down as he passed without any driver faults. Well done from everyone at Revolution especially from your instructor Simon. Congratulations to Charlotte from Mansfield Woodhouse on passing her Driving test at the first attempt. Charlotte passed with only one driver fault and now looks forward to getting herself on the road in her Mini. Well done from the whole team here at Revolution and especially your Driving Instructor Michelle. Mia from Crish passed her test on the 20th November at Ashfield Driving Test Centre. Well done for passing at your first attempt with only a handful of driver faults. Mia now looks forward to being able to drive to work in Matlock. Jack from Kirkby in Ashfield passed his driving test at the first attempt with zero driving faults, congratulations!! Lauren from Mansfield took lessons with Ian and passed with only a handful of driver faults and is looking forward to driving to work and more importantly the supermarket. Charlotte of Mansfield Woodhouse took lessons with Michelle and passed first time with only 1 driver fault for being too nice and letting some oncoming cars pass before herself! Now she can get her Mini on the road and travel to college and further afield. Daniel passed his driving test at the first attempt after taking driving lessons with John. Daniel took control of his test and passed with only a handful of driver faults. Congratulations to Kirsty who passed her driving test recently at Ashfield Test Centre. Kirsty took driving lessons with John and passed at the first attempt. Congratulations to Tracie from Wheatcroft Nr Crich who passed at Ashfield Driving Test Centre. Tracie passed at her first attempt with only 2 driver faults. Huge congratulations from the whole team at Revolution. We are pleased to introduce Songul who recently passed her driving test after taking lessons with John. 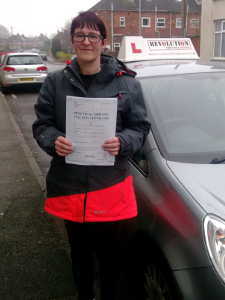 Songul from Belper passed her driving test at Ashfield with only a handful of driver faults. Good luck with your future driving from the whole team here at Revolution. Kelly from South Normanton passed her driving test after taking driving lessons with John. It’s taken some time to get there but it makes the result all the sweeter. Well done Kelly and good luck for your upcoming marriage and future driving life. Charlotte from Bilsthorpe passed at the first attempt. 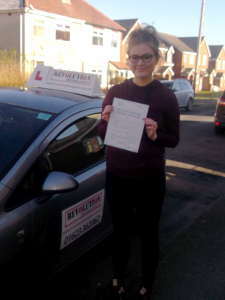 Charlotte took her Driving lessons around Worksop and passed there with the minimum of fuss, with the Examiner only marking 3 driver faults on the drive. Charlotte worked hard at filling the gaps in her driving knowledge and experience. Well done! Liz from Mansfield, passed her driving test on the morning of 4th September at Ashfield Driving Test Centre. Liz passed for at the first attempt after having lessons with Instructor Rob. Liz suffered from a few pre-test nerves but managed to get over them to pass with relative ease with only 4 driver faults. James from Shirebrook passed at Ashfield. James took driving lessons with Revolution Driving Instructor Rob and passed at the first attempt. A great learner who took on board the advice and implemented the techniques advised. James passed his driving test comfortably with 5 driver faults. Chloe from Mansfield passed first time with only 1 driver fault. She is now looking forward to lie ins and McDonald’s drive throughs in her Lupo. Well done from your instructor Ian. Deanna from Mansfield Woodhouse took lessons with another school prior to finding us. Your instructor Michelle and all the team would like to say a huge congratulations passing your test first time!! Pass today for Brooke from Wirksworth who passed at Buxton Test Centre. Congratulations from your instructor John. Hollie from Forest Town passed her driving test after taking lessons with Michelle. Hollie is now on the hunt for a Beetle! Nick from Sutton in Ashfield took driving lessons with Ian and after only 22 hours of tuition passed his test at the first attempt with only 1 driver fault! Congratulations Nick. Rebecca from Mansfield Woodhouse took lessons with Michelle. Well done, Rebecca, for overcoming your nerves and passing with only one driver fault. Nathan from Shirebrook passed his driving test after taking driving lessons with instructor Rob. He passed with zero driver faults which is exceptional – well done Nathan!! Ricky passed his test at Ashfield Test Centre after taking lessons with Simon. Congratulations for passing with only 4 drivers faults. Meet Anne-Marie who passed her driving test at the first attempt today, she is from Norway and is on a student exchange and now leaves to return home with a full UK driving licence. Anne-Marie passed her theory last week and we didn’t mess around in getting her test booked and passed. She now looks forward to camping holidays in Sweden and being able to drive back home. Anne-Marie took driving lessons with Revolution Instructor Ian. Matt from Huthwaite passed at the first attempt with only 4 driver faults. Matt took his Driving lessons with Ian. Passing will now allow Matt to pursue better job options and generally enjoy the freedom of driving. Matt from Sutton in Ashfield Passed 23/5/18 with only a handful of driver faults. Matt took his Driving lessons with Revolution Driving Instructor Michelle and is looking forward to getting his own car soon so he can drive to work. Samadul (Sam) Haque from Kirkby in Ashfield who passed his Driving Test today (22/5/18) with 4 driver faults. Sam took driving lessons with Revolution Instructor Simon and overcame his nerves to pass his driving test after having a terrible experience with another driving school. We are pleased to announce that Kealie from Rainworth Passed her driving test at the first attempt on the 17th May 2018 with only 4 driver faults. Kealie put in a composed drive and really benefited from putting in the extra practice leading up to the test. She can now be her own taxi service and not rely on other people for lifts. Kirsty from Ollerton passed her test first time with only 3 driver faults. Having missed a test through illness Kirsty has worked hard to become a great driver and had a great test despite being very nervous leading up to it. Congratulations from your instructor Rob and all the team at Revolution. Sam passed her test today and is looking forward to taking her little boy out places and generally having incredible road trips. Congratulations and have fun! Well done Xavier who passed first time with only 2 driver faults. You can now enjoy warmer trips to work in the winter, rather than riding your motorbike. Scott passed his driving test at the first attempt with Revolution Driving Lessons, Scott had lessons with another instructor but after feeling he wasn’t getting where he wanted he decided to give us a call. We helped put some structure to his lessons to ensure progress was made and tracked to enable Scott to understand where improvements needed to be made. All this hard work on Scott’s part paid off by smashing his driving test with only 2 driver faults. Scott now has more job opportunities and can help ferry his family around rather than relying on public transport. Owen took lessons with Ian and passed at the first attempt at Ashfield Test Centre. Owen is looking forward to driving himself to football and swimming in his Fiesta which he has been practising in with his Dad. Kodie passed at the first attempt. Kodie can now stop getting the bus to work and finally has the freedom of a car to make everyday life a little easier. 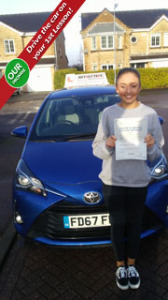 Lauren took lessons with Ian and passed at the first attempt at Ashfield Test Centre. Lauren is looking forward to going car shopping and being able to drive to work and college. Well done Shiree, you can now drive to work and be a Mum taxi. Well done to Sonia who passed her driving test at the first attempt after taking driving lessons with Revolution Driving instructor John. Sonia produced a lovely drive on the day and now looks forwards to many trips in the summer. Well done to Hayley who passed her test at the first attempt. After graduating from Revolutions under 17 Program Emily embarked on her driving lessons in Mansfield and the surrounding areas and before we can blink shes only gone and passed. Not only did Emily pass first time BUT with ZERO driver faults marked by the examiner. Well done! Hope you are looking forward to the work commute now Emily. All the best from MIchelle and the whole team at Revolution. Don’t delay get in touch today to secure your driving future. Olivia passed first time after taking lessons with Ian. Olivia and her sister both passed with Revolution and she is now planning on getting on the road as soon as she has a car. Marley passed at the first attempt and now looks forward to driving to work and not relying on public transport. Marley took his driving lessons with Ian. Congratulations to Louisa who passed with 4 driving faults on her 2nd attempt. Everyone I’d like to introduce you to Charlotte from Mansfield who passed her driving test this week with only two driver faults. 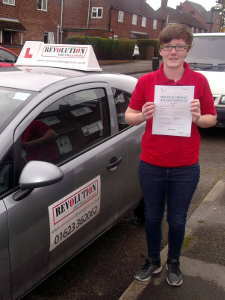 Charlotte is the youngest and latest member of her family to pass after taking driving lessons with Revolution. Charlotte took driving lessons with Revolution Driving instructor Ian and kept her cool to produce a stunning drive to get hold of the priceless pink licence. Charlotte is looking forward to being able to travel to see her boyfriend and generally just go to Nandos. Well done and good luck in the future. Ross passed 1st time with only 4 driving faults.